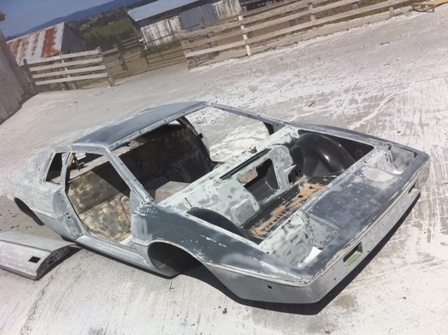 With the body of my Esprit completely apart, I sent it off to be soda blasted (essentially baking soda sprayed at high pressure) to remove the old paint. 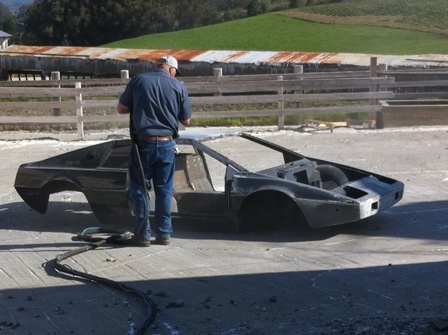 The process is extremely tricky because you can blast straight through the gelcoat and into the underlying matte. We were patient setting the pressure until the soda was just attacking the white primer sealing coat (not the gelcoat), then we stopped. From here I’ll have to block down the remaining white primer and into the gelcoat for a smooth surface that will accept an initial sealer/primer coat. The process was also helpful for removing the interior carpet residue and glue left over by the old upholstery. The car looks absolutely horrid and depressing right now, but that’s usually how it goes in this phase of the body prep process! A nice shot of the S1 body low to the ground prior to soda blasting. The body halfway through the process, looking pretty beat up. Thanks for the compliment. The car was originally black, but I'd like to paint it white with tartan/green/orange interior. Not completely original in the sense of my particular car but original from an S1 perspective. I'm not sure of the chassis number - where do those live on the car?!?! Thanks Doug - I'd definitely like for you to see the car when it's finished. Will keep Rachelle posted.